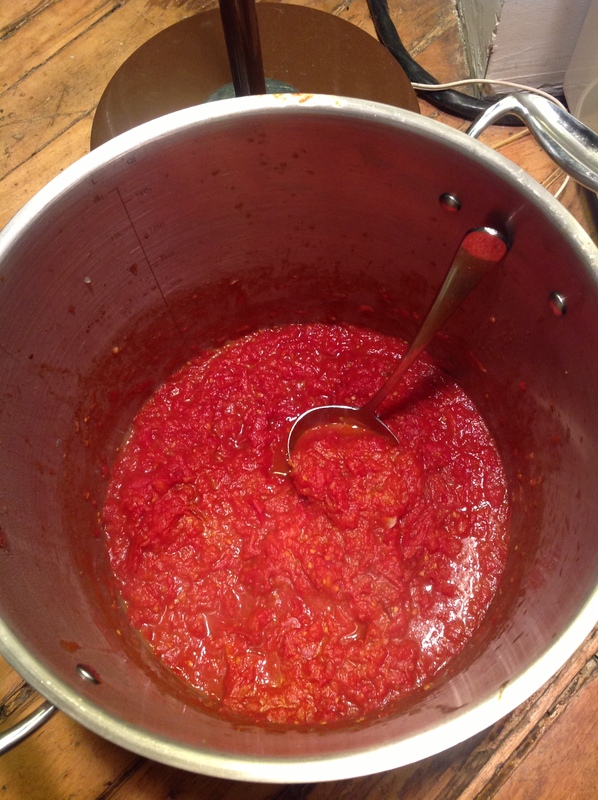 Intro from Sue: Finally am posting this witty and perfectly timely recipe for making your own homemade sauce as we head into March and another deep freeze. It comes from the muli-talented and multi-tasking Johanne DuRocher. When is there NOT a time for deliciouso home made sauce? 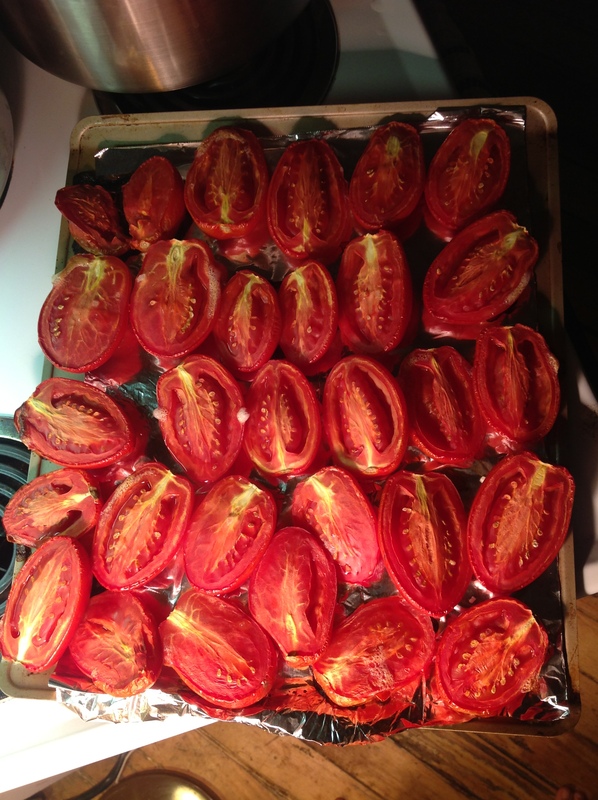 I shudder to realize Johanne created this wonderful post for me when tomatoes where seasonal and came in baskets–but I like to roast tomatoes in the winter before I use them to intensify the flavour and think you will still get delightful results. And now to the good stuff…. It was Thursday night, pushed to the last minute. I still had, oh, say five hundred things to do before I was about to head out of town for one week. I can multitask. It’s been years since I wanted to do this and so one day late in the summer I rode home on my bicycle with a basket of roma tomatoes from the farmer’s market- that’s the first step in making sauce. I had even asked one of my Italian colleagues at work to take notes as she made sugo the weekend prior with her family. Sonia had a few pages of instructions for me about making it The Authentic Italian Way, which I really wanted to know and duplicate. I was pretty pumped- I wanted to achieve Italian flavours, not whatever sauce flavours I’d achieved before. I was very excited to make my sauce pass off as the real Italian home made sauce. Already my authentic sauce dreams were starting to run. Making sauce the real Italian way is ambitious to even Italians (another sauce lesson). But they’re compulsive and can’t help themselves so there is sauce year after year. When I came home on Thursday night, it was after a full office day, a hair dresser’s appointment and a gift shopping blitz for said Winnipeg trip. It was 8pm and I still had a list of to-dos, not to mention blanching. This recipe is what happened on that night and, let me be the first thousandth person to tell you that everyone makes sauce differently. This I would call extreme sauce making. No blanching (obviously) no seeding (as if) and I crushed with my potato masher. It was also 30 degrees in my place. If you can still find a nice basket of farmer’s market tomatoes, get your sauce going and then get thee to Winnipeg. And note: I finally ate this sauce with spaghetti pasta and it is incredibly delicious- has a lovely garlic flavour, umami-lovin weight and tomatoeyness. I’ve also been told that it’s preferred to the real authentic Italian mama sauce we have. Ha! Step 1. Slice your tomatoes in half, length wise, and then place them on an olive-oil greased foil or parchment paper or straight up on a baking sheet flesh side up. Basted them with olive oil if desired. Sprinkle with sea salt. So far so good on slicing the tomatoes in half. Side note: not all my tomatoes fit onto my baking sheet so I seeded and diced the rest and reserved them raw, un-roasted, for later. 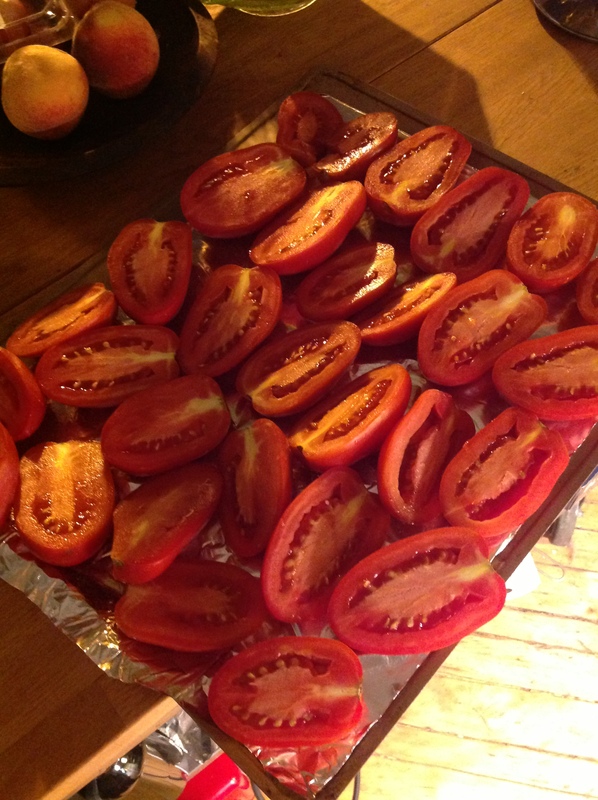 Two or three tomatoes didn’t fit on my baking tray so I coarsely chopped them and added them later. Note the time: 9:51PM and doing fine. It really didn’t take long to make this sauce. 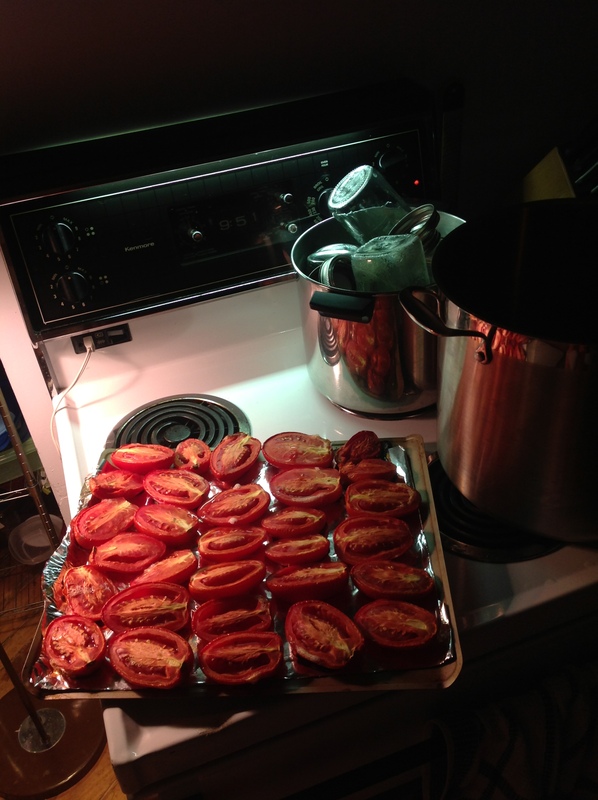 Transfer roasted tomatoes to a large sauce pot. Add reserved tomatoes. 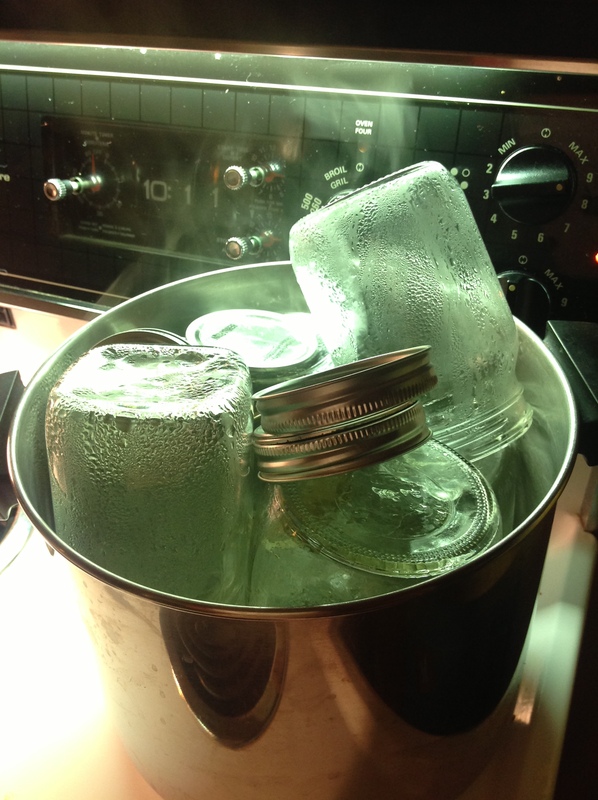 Prepare jars for canning: while the tomatoes are roasting, sterilize your jars by adding them and their lids (removed) to a large pot, then fill the pot with boiling water and continue to boil on the stove. Keep boiling as you make the sauce- can’t hurt to leave that going. 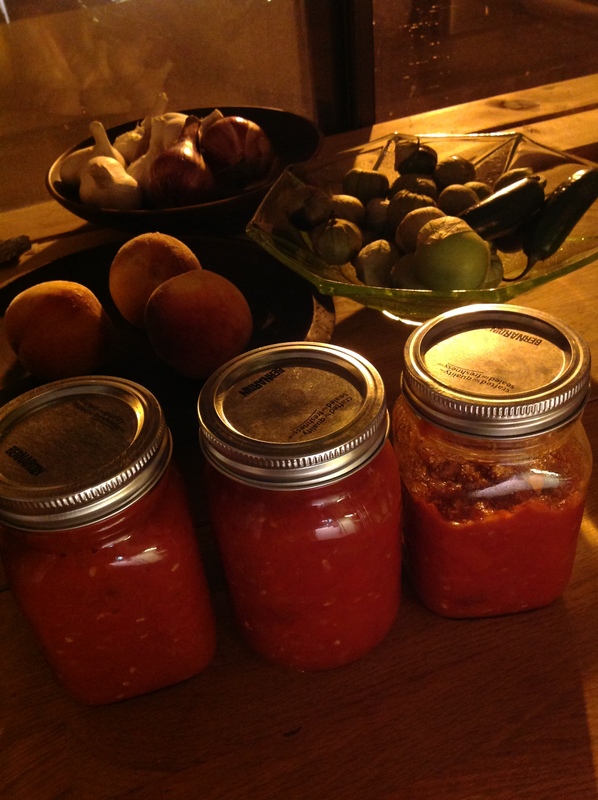 I read that 10 minutes ought to sterilize your jars but mine were in the boil for much longer while the sauce simmered. 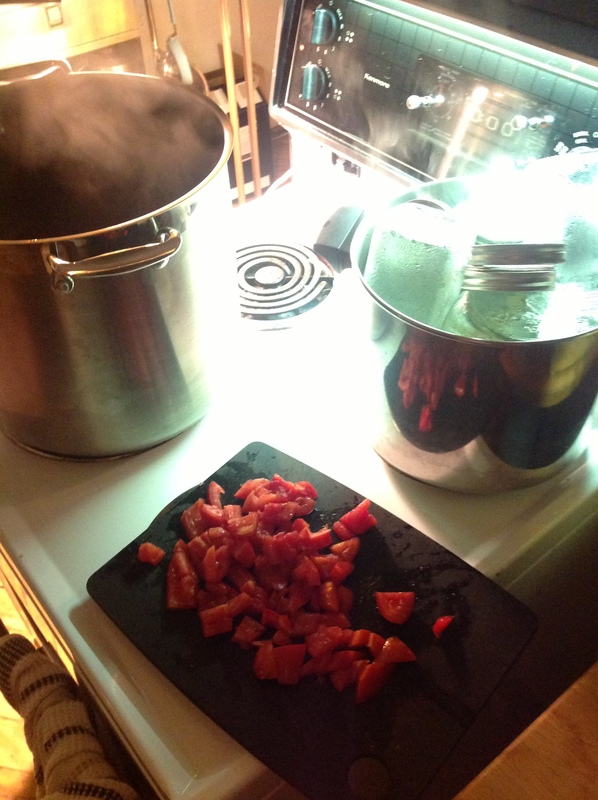 Step 3: Back to your sauce: mash the tomatoes using a potato masher. I’m thinking an electrified device would also work and give you a smoother sauce, whereas the masher gives you a somewhat chunky sauce. Have fun. Now it smells amazing in your place. Step 4: Add an entire bulb of grated fresh green garlic. 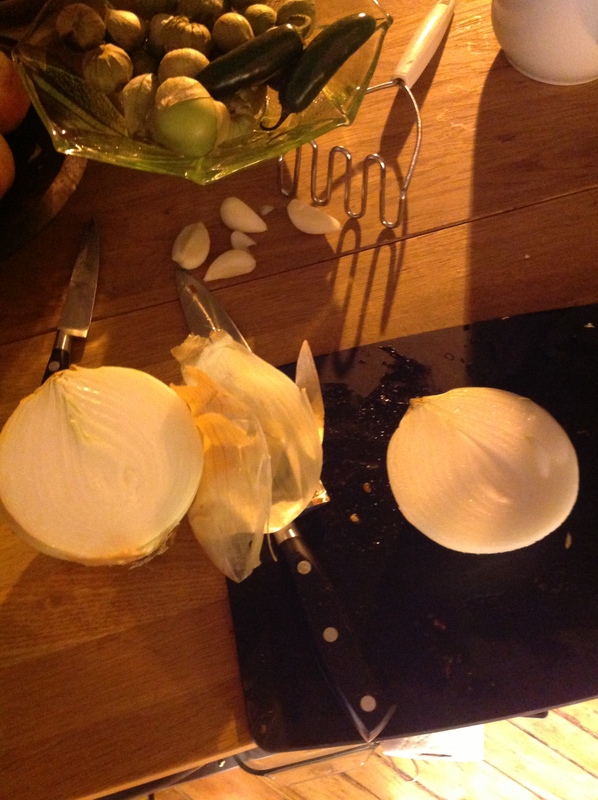 Grate 1/4 of an onion and add. Mash some more. See how simple? A little bit of onion, a bulb of grated garlic and a potato masher. Step 5: Heat sauce to a simmer and maintain the gentle boil. Stir occasionally and assess thickness- simmer longer to help reduce the liquid volume. When your optimal thickness is reached, remove from heat. This might take 30 minutes to an hour. Plenty of time to do your nails, wax your legs, pack a suitcase. Step 6: Using oven mitts, empty out the boiling jars from their water bath and fill with sauce. 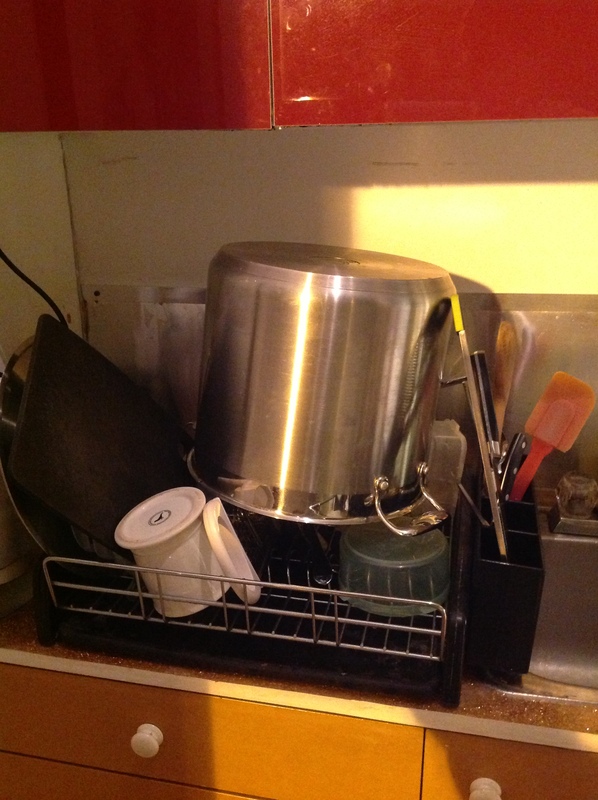 Screw on lids and let cool on rack at room temperature to seal. 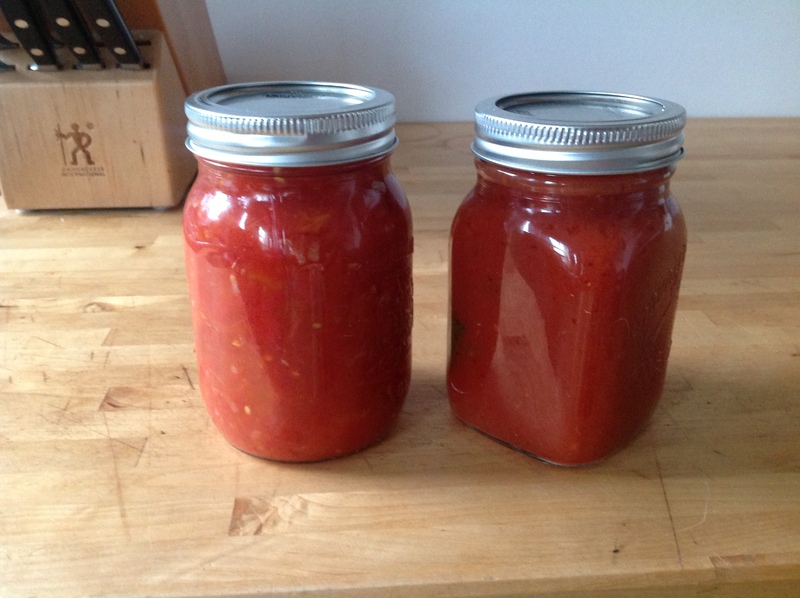 Makes: 2 1/2 jars (seems like not a lot of sauce, makes one appreciate homemade Italian sauce…..) The half-filled jar will have to be consumed within one week or frozen. Sealed jars will keep for months. These are liquid gold in our home. I’ve since made this sauce recipe again and it was just as delicioso. Look at the size of this sauce pot! This one also does my lobster boils, poultry stock, you name it. When’s the last time you made yourself a Muffuletta Sandwich? I could worship at this altar. Thinking about lunch? Always–if you’re like me. This week for the Globe’s weekly Lunch-wich I made a Muffuletta. Hadn’t had one in ages, but I could barely stop myself from digging in pronto–only the knowledge that my job was to photograph (not devour) this guy kept me in check. I’m not a big fan of the cold-cut loaded submarine, but somehow this combo of capicola, mortadella, ham and salami plus swiss and provolone cheese seems ingenious. And then you add the savoury, finger-licking olive salad on top (and underneathof course). I used foccacia but traditionally this New Orleans original is made from a Sicilian loaf, also called Muffuletta bread. 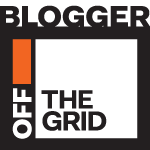 Check out the official Muffuletta website. COOL. 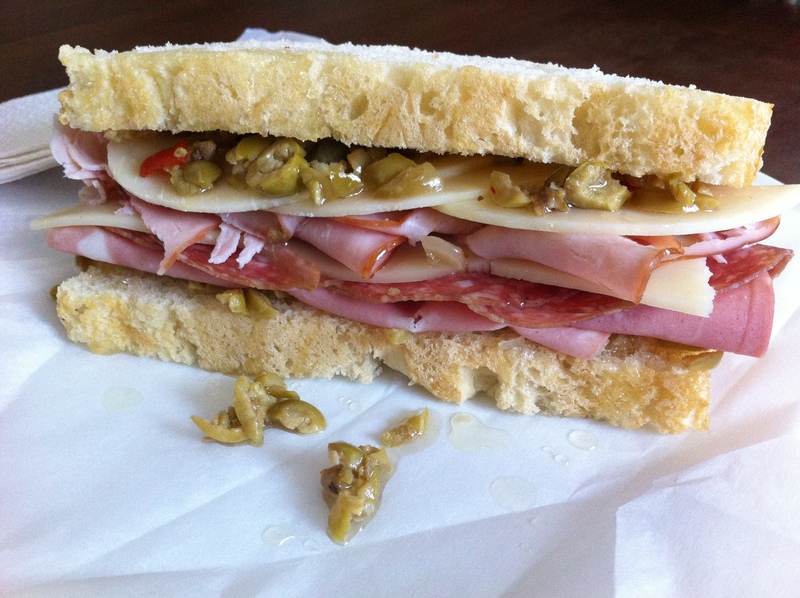 (someone actually has a job called Muffoletta Research Specialist, really, go look.) And yes, there are variations on the spelling. So I’ll just stick with one simple word: heaven.